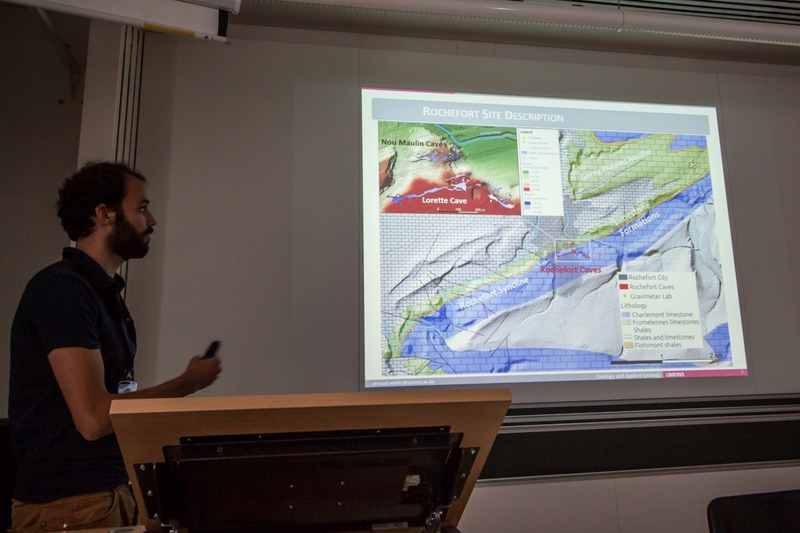 In particular, he comments on the gravity measurements, electric tomography profiles and hydrogeological investigations performed by the Royal Observatory of Belgium, U. Mons and U. Namur. Present knowledge of karst systems has evidenced the importance of the vadose zone on the water dynamics. Temporary perched aquifers can appear in the subsurface, especially in the epikarst layer, due to changes of weather conditions, reduced evapotranspiration and the vertical gradients of porosity and permeability. Seasonal water variations in the infiltration zone of a karst system should then be observable with geophysical techniques. Monitoring these variations may help separate the hydrological signature of the vadose zone from that of the saturated zone. Although many difficulties are usually encountered when studying karst environments due to their heterogeneities, cave systems offer an outstanding opportunity to investigate vadose zone from the inside. We present results covering two years of hydrogeological and geophysical monitoring at the Rochefort Cave Laboratory (RCL), located in the Variscan fold-and-thrust belt (Belgium), a region that shows many karstic networks within Devonian limestone units. Hydrogeological data such as flows and levels monitoring or tracer tests performed in both vadose and saturated zones bring valuable information on the hydrological context of the studied area. Combining those results with geophysical measurements allows validating and imaging them with more integrative techniques. A microgravimetric monitoring involves a superconducting gravimeter continuously measuring at the surface of the RCL. Early in 2015, a second relative gravimeter was installed in the underlying cave system located 35 meters below the surface. This set up allows highlighting vadose gravity changes. These relative measurements are calibrated using an absolute gravimeter. 12 additional stations (7 at the surface, 5 in the cave) are monitored on a monthly basis by a spring gravimeter.